I have sold a property at 3435 SLOCAN ST in Vancouver. Meticulously maintained family home on the crest of the hill on quiet tree-lined family friendly street in Renfrew Heights. Lush front yard & a huge west deck off upper lvl means you can relax & enjoy the sunsets over the horizon. Main has 2 bdrms, bathrm, living rm w/ gas fp, dining rm & bright kitchen. Up is a master bdrm & bathrm leading to large deck w/ great city & mtn views. Down has cozy 1 bdrm suite w/ gas fp in living rm on one side ready for you to find your own tenant or use as your private hangout space + storage. Beautiful front & back landscaped yard, carefully tended for years w/ fruit trees, magnolia tree, raised vegetable garden plots etc. Easy access to Nanaimo or Renfrew Skytrain stations, close to Beaconsfield Park, don't miss this opportunity to check this out! I have sold a property at 25 5510 Admiral WAY in Ladner. Residential property sales in the region totalled 4,781 in April 2016, an increase of 14.4 percent from the 4,179 sales recorded in April 2015 and a decrease of 7.6 percent compared to March 2016 when 5,173 homes sold. April sales were 41.7 percent above the 10-year sales average for the month. New listings for detached, attached and apartment properties in Metro Vancouver totalled 6,127 in April 2016. This represents an increase of 3.9 percent compared to the 5,897 units listed in April 2015 and a 2.4 percent decline compared to March 2016 when 6,278 properties were listed. The total number of properties currently listed for sale on the MLS® system in Metro Vancouver is 7,550, a 39.3 percent decline compared to April 2015 (12,436) and a 2.6 percent increase compared to March 2016 (7,358). The sales-to-active listings ratio for April 2016 is 63.3 percent. This is indicative of a seller’s market. The MLS® Home Price Index composite benchmark price for all residential properties in Metro Vancouver is currently $844,800. This represents a 25.3 percent increase compared to April 2015. Sales of detached properties in April 2016 reached 1,979, an increase of 9 percent from the 1,815 detached sales recorded in April 2015. 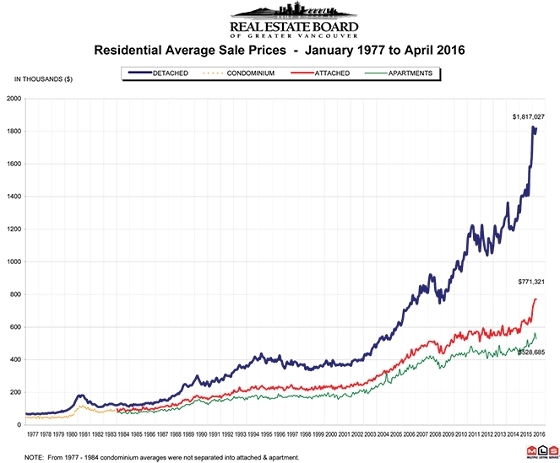 The benchmark price for detached properties increased 30.1 percent from April 2015 to $1,403,200. Sales of apartment properties reached 2,107 in April 2016, an increase of 33.4 percent compared to the 1,579 sales in April 2015.The benchmark price of an apartment property increased 20.6 percent from April 2015 to $475,000. Attached property sales in April 2016 totalled 695, a decrease of 11.5 percent compared to the 785 sales in April 2015. The benchmark price of an attached unit increased 22.1 percent from April 2015 to $608,600.